It’s important to note that as we age, naturally the elasticity and glow from our skin will start to dimmer. If you’re looking to reverse the signs of aging and improve your skin’s appearance, there’s a 4-product process that can do just that. The Core 4 Skincare Program is made up of 4 medical grade skincare products to incorporate into our daily routine to rejuvenate your skin. These include growth factors, retinol/exfoliant (which we’ll talk about today), antioxidants and sunscreen. The best part? This system is clinically published and tested with results that prove its purpose with astounding results. 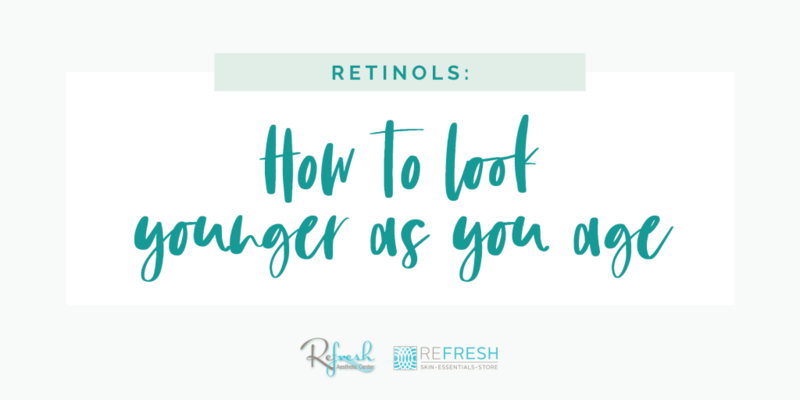 Today, we’re going to break down what, why, how to use a retinol: Retinols are a form of Vitamin A that is applied directly to the skin. Specifically, it supports the growth of collagen and skin renewal (which starts to decline in your 30s) to decrease fine lines and improve your skin’s appearance. In addition, your skin can appear smoother and even-toned, allowing for makeup application and products to be absorbed more thoroughly. Using retinol products helps speed up the internal renewal of skin cells and reverse skin damage (a big win for those childhood summers). Now is the time to listen closely, because we’re getting technical and very specific. The way your skin reacts to retinol is entirely personal so it’s important to start small and make sure you can work your way up to a product that complements your skin well. Because this is a Vitamin A product that eliminates damage and increases production to renew skin cells, you will want to start with a light dose of about .25%. Once you know how your skin reacts to the product, you can slowly increase the amount and consistency you use the product. Keeping in mind, regardless of weight, retinol products are very useful. When applying retinol, use a pea sized amount of the serum over your face and neck at night under your moisturizer. Start with using for 2 days on, 1 day off until you are comfortable with the product, or even slower (1 to 2 times per week for 2 weeks) if your skin is extra sensitive. What are the best products to use? We recommend SkinMedica, Revision & Avene (for sensitive skin) Retinol is the second product in our Core 4 series following Growth Factors. Take a peek at our last blog post to hear more about growth factors. Whether you’re looking to prevent or improve the signs of aging, using this type of skincare routine is going to benefit your lifestyle. Make sure to check out the products we carry at ReFresh’s SkinEssentials Store, and ask our staff next time you’re in!